I woke up pretty early on Christmas Day. The first thing I did was to listen to the rain hitting the window of my parents' house, where we were staying for Christmas. At one point I even heard a few cracks of thunder, fortunately it passed pretty quickly. The ladies (mrs7t and lime) were still fast asleep and not likely to be waking up until at least 10.30am, so I didn't feel too bad when I crept out of the house to take part in two Christmas Day parkruns.. The first one was Hilly Fields, this was my second visit to this parkrun. It's not a fast course, in fact it's one of the toughest in London, but I love it. At 8.20am I arrived and spent the next 30 minutes sitting in the car watching the rain. It was absolutely tipping it down. Then by some miracle I saw a patch of blue sky, a few minutes later the rain eased and then stopped. I joined the 20-strong group of parkrunners at the meeting point and at 9am we were off for three roller coaster ride laps of the appropriately named green space. Although, the roller coaster had changed into something more like one of those water rides. We were advised that this was a parkrun-lite - there were no direction signs or marshals on the course. The grass sections, especially at the lowest point of the route, had suffered from all the recent rain and were waterlogged. In fact, it was more like running through a stream at points. Luckily I was expecting this and was wearing my trail shoes for extra grip on the muddy grass and had packed extra socks and shoes. Three laps complete and I crossed the finish line. The rain had held off for the entire run! I had my barcode scanned straight away and thanked the volunteers as I ran off towards the car to make the short trip down to parkrun number two. I parked up on a side street next to Dulwich park, it was still absolutely chucking it down. I had already changed my top, socks and, as this parkrun is run entirely on tarmac paths, I had also changed into my road shoes. It's pretty flat so is a good course to run a decent time. I found the toilet, which I was happy to find open. It was an excellent place to shelter from the rain until 9.55am when I made my way over to the start point. 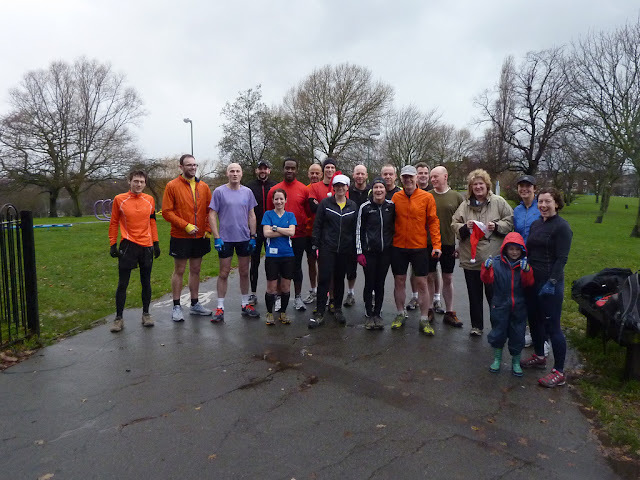 There were a lot more people at this run (just over 50) and the group I found myself standing with contained runners that were also running two parkruns. Some had come across from Bromley and I believe some others from Brockwell. The rain did not ease off at all during the run and some sections had shallow streams running across them. But it was a lot of fun running in the heavy rain. The course is really easy to follow, it's just three anti-clockwise laps on the main path that runs around the park. After the first lap I really started to push hard and kept going until the very end. Completely drenched from head to toe, I headed back to the car and then back to my parents' house to get the next part of Christmas underway. The volunteers were the heroes of the day and I am extremely grateful to them all for giving up their Christmas Day mornings and standing in the rain all so that we could get our Christmas parkrun fix.